Sing a song? Light the lantern? Sweepness? Well…almost anyway. 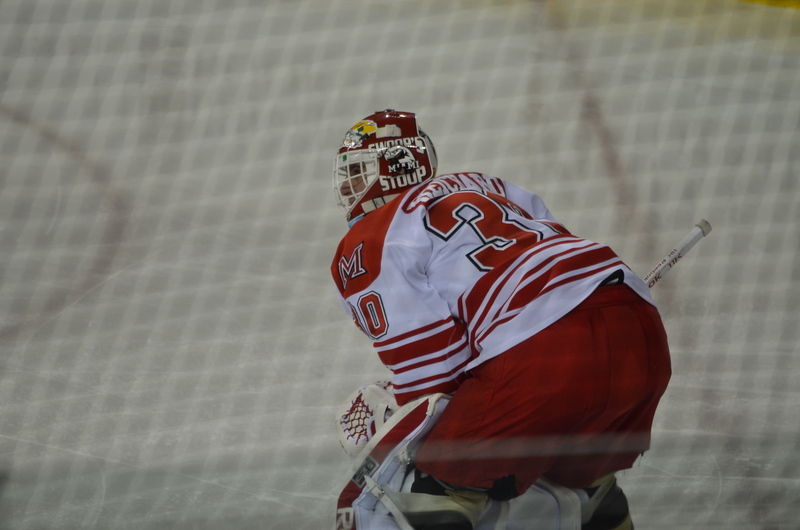 The Miami RedHawks came back to Goggin Ice Arena and despite a rough first period on Saturday night, got their season in full gear for a young team that is now atop the CCHA standings. That feels good to say… “Atop the CCHA standings.” After opening the CCHA’s Celebrate the Legacy season with road trips to Michigan (now 6-46-3 all time) and Ferris State (always a tough place and opponent), to come out of the first 3 weekends of CCHA play on top feels real nice. In the process, Miami has seen freshman goaltender Jay Williams take the spotlight in what we thought would be another 4 years of rotating goalies. While we still will likely see the rotation for a while, Ryan McKay stayed on the bench – a sweet sweet luxury that head coach Enrico Blasi will certainly enjoy. If Williams does continue to get the nod and later falters, a healthy, rested and eager McKay will be eager to get back out there. Knowing Blasi, however, McKay has healed up and will be back on the ice against Michigan State next weekend. In any event, Williams improves to 5-2-1 on the year, has a .911 save percentage and is allowing just 2.5 goals per game. Last night, Jay stood tall in net (at 6’2″ I suppose he is always standing tall) despite a lot of untimely turnovers and 2 awful embellishment calls from the Referee combination of Steven McInchak and Rodney Tocco (did somebody say Taco?). They certainly cost Miami 2 power play chances that Miami could have turned into paydirt.. In addition, the 2 embellishment calls were widely contested by the raucus Miami crowd last night, and at the end of the night, may have earned coach Blasi a penalty on consecutive nights. On Friday night, Miami was assessed a Bench Minor at 15:20 of the third period, and Blasi was less than pleased with McInchak and Taco Tocco. It may have been because NMU’s Kyle Follmer was called for unsportsmanlike conduct after the whistle. That was Follmer’s 4th 2-minute minor of the night, and he continued some of his antics on Saturday night with another 2-minute minor in the 2nd period. Then, during Saturday’s handshake line, Blasi was seen having a civil conversation berating one of the linesmen and a 10 minute misconduct was added to Miami’s totals when everything was said and done. To say that Da Coach was upset would be an gross understatement. An unnamed source has given us an inside scoop as to what happened this weekend from an officiating standpoint. Apparently Coach Blasi despises is less than friendly with McInchak, and because of it has even gone to CCHA head of officials Steve Piotrowski about the situation. Whether it be a history of awful calls or just a general distaste for the guy, McInchak hasn’t been to Oxford in over 4 years. Friday night’s call that cost Miami 2 minutes in the box was just the start, and it escalated on Saturday. Rico could be heard across the arena on one occasion (after the second of 2 embellishment calls), and to put the feud to rest, McInchak finished the weekend with a 10-minute misconduct for the bench (which was shaking hands at the time), primarily aimed at Rico. In good news from the weekend, Alex Wideman made sure that we knew he was back on the ice last night as well. The shortest player on the team at 5’7″ can get lost out there sometimes due to his size. Last night, it came at the right time for him to reappear after missing a few weeks with an mono. With just 2:13 left in the night, Wideman knocked home the game-tying goal just over NMU goalie Jared Coreau’s pad as he tried to hug the post (It was eerily similar to the game tying goal that snuck past Cody Reichard against BU in Washington, DC in 2009). Then, Wideman streaked down the ice and put the game winner past Coreau in the shootout to delight the hometown crowd. You can view the 2 shootout goals at the bottom of this page! To top it off, after the weekend, just 3 RedHawks have yet to score on the season: Michael Mooney, Paulides and Taylor Richart. To say that Richart has been unproductive, however, would be a gross understatement. He may just be the best defender on the ice, and I’ve yet to see him look nervous or rattled. Usually Miami is a team that scores early and holds on for the victory. This year, however, Miami has evened things out and have 9 first period goals, 9 more second period goals and 11 third period tallies. On the other side of the puck, Miami has allowed 10 first period and 8 third period goals, and just 2 in the middle frame. After taking 11 points against the first 3 teams from Michigan these last three weeks, Miami welcomes yet another team from that state up north in the Michigan State Spartans. MSU smashed Michigan on Saturday night by a score of 7-2 after betting slammed 5-1 on Friday night. To this point in the season, all 11 teams are still just one weekend sweep of 1st place, as Miami stands at 11 points and Northern Michigan is in 11th with just 5 points. There’s a long way to go in the season, but the Hawks are positioning themselves well to start things off. After this weekend, Miami is now 2-2-1 on Fridays this year, having lost their last 2 Friday night games on the road, and compared to 4-0-1 (1 SO Win) on Saturdays. On the injury front, Miami seems to be back at full strength. Ben Paulides, who had been out for a couple weeks returned to action for both games this weekend. As did Wideman (mono) and Joe Hartman (ankle). After tallying a goal and 2 assists Friday, and adding an assist on Saturday, we think we’ll see another CCHA Rookie of the Week award for Riley Barber. Barber is now the CCHA’s leading scorer with 5 goals and 9 assists. Czarnik (6G, 7A) is just behind him, tied with Michigan’s A.J. Treais with 13 points. First of all, congratulations go out to @RedHawkCooch on Twitter. 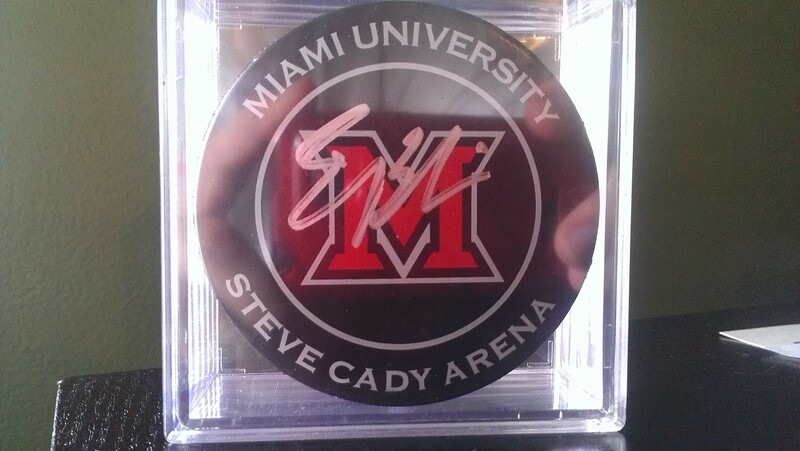 “Cooch” won our first ever trivia contest and is the winner of this puck, signed by Coach Blasi. Keep an eye out for future trivia contests, and thanks to those of you who participated and follow us on Twitter! Weekend Sweep over UAH complete, here are your #SixPacks! In the event that you don’t follow us on twitter … wait … that would be unfortunate. In the event that you don’t use twitter, here are your Saturday and Sunday #SixPacks. If you’re not following us (for shame!!! ), head over to http://www.twitter.com/redskinwarriors to follow along! 13 of #MiamiU ‘s 16 wins have come against Teams Under Consideration (TUC’s) in the PairWise. Now up to 16th & squarely on the NCAA bubble. Did you see the #SixPack today? Add another period where #MiamiU holds their opponent to 3 shots or less. 19-3 advantage that period. After a bit of nervousness, the @MiamiIceHockey #RedHawks pull it together and finish the sweep against #UAH. Sunday #SixPack time! FSU & NMU were able to #sweeptheleg this weekend. 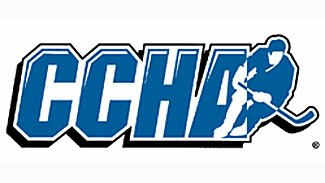 Standings at http://www.ccha.com. Ohio State won (gasp!!!) for the first time in 2012. It wasn’t long ago – until just two months ago, in fact – that The University of Alabama-Huntsville Chargers thought they were playing in their final season at the Division I ice hockey level. At times, it seemed like they are as pitiful as my adult rec league team, having been shut out for the weekend by Ohio State in Huntsville, followed by another shutout loss at the hands of Providence. UAH got on the board after those 3 consecutive shutouts, but the Chargers were again shut out for a weekend by Merrimack and UMass-Lowell, and finally were shut out for their weekend series against Bemidji State. The men’s Division I Ice Hockey program is on life support, as UAH is the only remaining independent team Division I men’s ice hockey, and the team’s 2011-12 results may be an indication of that uncertainty for the program. If you are in love with have a man crush on NCAA hockey like the Redskin Warriors, go HERE to support the Save UAH Hockey cause, as the future of the program still swings somewhat in the balance. As of recently, the newly installed President at the university has re-pledged his support to the hockey program, and it seems to have lit a small spark under the student athletes from hockey’s southernmost college program. Huntsville’s record may be a weak 2-26-1, but don’t be fooled. On January 6th, they took down then 10th-ranked Denver. Two weeks ago, UAH stood strong against Current #2 Minnesota-Duluth, losing twice, but both were 1-goal games. Last Friday, the Chargers almost upset Maine. The Chargers were up 3-0 after two periods, but Maine flexed their muscle and came back for a 4-3 overtime victory. After being up 3-0, UAH allowed 9 unanswered goals, however, and lost Saturday night 5-0 as well. That was the 10th time overall the Chargers have been shut out, and Miami will be the team’s last 2 regular season games before playing the USNTDP in 2 weeks. In addition to the hockey series in Oxford, Cody Reichard will be featured for his off-ice accomplishments as well. His charitable organization, Swoop’s Stoop will be featured this Saturday in a number of ways. First of all, to raise additional funds for the charity, the RedHawks will also wear a special jersey on Saturday night to honor Reichard and the children he supports. The jerseys will later be auctioned off to Miami fans and supporters, with all proceeds to benefit the charity. Before the start of the game, a pregame ceremony will feature Cody, and you can bet that he’ll be in net on Saturday night for the Hawks. Visit the MU RedHawks Swoop’s Stoop page which will link you to a few other stories. Make sure to Vote for Cody in the CLASS Award here. He needs your votes to continue on to the award finals! Reichard Named a Finalist for Lowe’s Senior CLASS Award – Cody is one of 10 finalists, 5 of which come from the CCHA. If skating around with 20 year old young men who smell like hockey after skating their rear-ends off for 2.5 hours is your thing, join the RedHawks for their annual Skate with the Hawks night on Saturday as well. Good luck to the Lady RedHawks this weekend as well! Miami’s Women’s Club Ice Hockey team heads to Grand Rapids, Michigan for their conference tournament. They kick off play against Ohio State Friday night. We’ll keep you posted on how the RedHawks fare this weekend. UAH Comes in having scored just 35 goals on the season and allowing 119. This could be the weekend the ‘Hawks need to re-open the scoring gates after being limited to just 1 goal last weekend. To contrast, Reilly Smith has 20 goals himself. The Chargers are led by Freshman Kyle Lysaght with 7 goals and 6 assists, and Sophomore Mac Roy, who has 6 goals and 6 assists. Miami was shut out for just the 2nd time this season last Saturday at Michigan. If it makes you feel any better, those 2 shutouts came against Ferris State and Michigan, the #1 and #3 teams in the CCHA, and the #2 and #4 teams in the PairWise. Miami stands at #18 in the PairWise, and need all the wins they can get in order to make the NCAA tournament for the 7th straight season. This weekend’s series is the first time since December 2-3 that their opponent isn’t a ranked team. Northern Michigan was not ranked that weekend, although they are now ranked #19 by USCHO. Miami will come out strong and bury the weaker foe both nights. 5-1 on Friday. Cody’s night wouldn’t be complete without taking the all-time shutout mark at Miami. Cody gets the shutout 4-0 on Saturday.Both games this weekend will air on ONN in the state of Ohio. Friday’s puck drops at 7:35 and on Saturday, things get started around 7:05 after the Swoop’s Stoop/Cody Reichard recognition ceremony.